My email runneth over with requests for more information about essential oils. Believe me when I say I am not an expert but as I experiment and learn, I will share my experiences with you. My latest foray into the world of essential oils has been to make “scrubs”. No, I am not referring to the duds worn by medical professionals but rather a grainy concoction of either salt or sugar plus some nourishing oil and essential oils. Some scrubs even include soap and thus become “cleaning” scrubs. Now mind you, these are not just for the ladies. The Survival Husband routinely gets the grit off of his hands and feet using my scrubs. Okay, I perform the scrub-the-feet duty but after 38 years of marriage, what can I say? 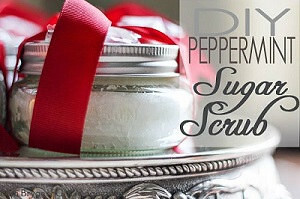 So, with all of this scrubbing in mind, how about a recipe for a a DIY Peppermint Scrub that you can make yourself. This scrub will make a wonderful gift to a special lady in your life and it is easy peasy simple. Guys, you can make it – and use it – too! 3 But What if I Don’t Like Peppermint? You will also need some empty jars. I use mason jars for gift giving but smaller plastic jars for myself. 1. 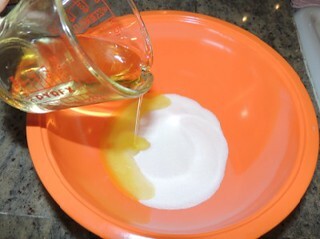 Mix your choice of oil (or a mixture of oils) with sugar in a large bowl. I find that a fork works best Keep working the oil and sugar mixture until is is sand-like. If it is too dry, add a bit more oil, a spoonful at a time until the mixture comes together. You should be able to pinch it between your fingers and mold it. 2. Add your Peppermint essential oil and mix well. 4. Before closing the jar, drizzle a few additional tablespoons of your oil on top. This will keep the scrub from drying out. 5. Decorate with a ribbon or bow and you are done. To use a scrub, you want to moisten your hands or feet, then scoop up a generous amount and slather it all over, rubbing lightly as you go. After a minute or two, rinse well under warm water and pat try. Your hands (or feet) are going to feel baby soft. Plus, if you had dirty nails or ragged cuticles, they will be sparkling clean and neat as well. Some folks use these scrubs on their face. If you want to try this, make sure your face is moistened very well with water first and test a small area before using the scrub on your entire face. If you have sensitive skin, or thin skin, proceed with caution’’. But What if I Don’t Like Peppermint? I make no excuse for wanting a bit of pampering from time to time. Like you, I work hard to insure my long term survival during these uncertain times and being able to freshen up with some of my homemade scrubs, soaps and salves is comforting. And heck, I sure don’t mind the money I am saving by shopping for lotions and potions right here in my own kitchen! Please give this scrub a try and let me know what you think of it. If you have not done so already, please be sure to like Facebook which is updated every time there is an awesome new article, news byte, or link to a free survival, prepping or homesteading book on Amazon. You can also follow Backdoor Survival on Twitter, Pinterest, and Google+. In addition, when you sign up to receive email updates you will receive a free, downloadable copy of my e-book The Emergency Food Buyer’s Guide. Bargain Bin: Here are some things to get you started making your own scrubs, salves, lotions and potions including Miracle Healing Salve. 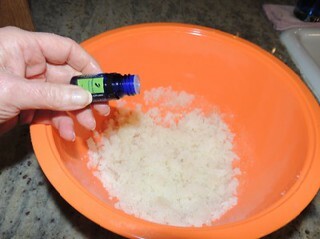 NOW Foods Essential Oils : My scrub was made using essential oil from Spark Naturals. For healing purposes, I feel they are superior. On the other hand, NOW Foods has decent essential oils at a budget price: NOW Foods Rosemary Oil , NOW Foods Peppermint Oil and Now Foods Lavender Oil. Spark Naturals Essential Oils: These are what you need for the Miracle Salve: Lavender essential oil, Rosemary essential oil, and Peppermint essential oil. 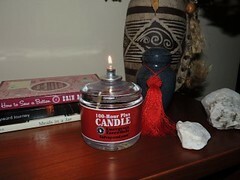 For the scrub, you can use just the Peppermint or any combination of E.O.s that are pleasing to you. Sweet Almond Oil, Moisturizing Oil : Now Foods comes through again with an affordable sweet almond oil. Your really can’t go wrong with this. Coconut (Fractionated) Carrier Oil : Once you start using coconut oil, you will be hooked. 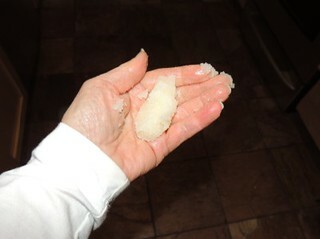 This is the fractionated coconut oil I used in my scrub (mixed with a bit of olive oil). White Plastic Jar with Dome Lid 2 Oz (12 Per Bag) : I chose to use these small ointment jars rather than Mason jars for my salve. I also have similar jars in the 1 ounce size. Beeswax Organic Pastilles, Yellow, 100% Pure 16 Oz: I ordered the white pastilles but have since learned that the natural yellow pastilles are better. That said, the difference may not be discernable – just be sure that what you purchase is cosmetic grade. Glass Droppers, Pack of 6 : I bought a package of these and loved them. When I went to re-order, I accidentally ordered plastic instead glass droppers. Learn from my mistake. The price is the same go get the glass ones. Nutiva Certified Organic Extra Virgin Coconut Oil: So far I am pleased with the Nutiva Coconut Oil. It is pure-white, USDA-certified-organic, extra-virgin coconut oil that is cold-pressed from fresh coconuts within two hours of chopping. No refrigeration is required and although it solid at room temperature, it melts at 76 degrees. I was able to easily liquefy a small amount and put it in a 4 ounce squeeze bottle where I re-liquefy by putting this smaller bottle in a glass of hot tap water. I paid $26.99 which included free shipping. The Complete Book of Essential Oils and Aromatherapy: I first became interested in aromatherapy and essential oils in the early 90s which was before they really became mainstream. I read every book I could get my hands on and dabbled at creating synergy’s (a combination of two or more oils that create a chemical compound that is greater than the some of its individual components). My bible then, and even now, is this book. Although I have plenty of flashlights and batteries (you might even say I have a flashlight fetish) I also stay stocked up with a dozen of these Clear Mist 100 Hour Plus Emergency Candles as well. For the best deal, purchase a dozen at a time to get a discounted price. Need something from Amazon (and who doesn’t)? I earn a small commission from purchases made when you begin your Amazon shopping experience here. You still get great Amazon service and the price is the same, no matter what. Just released! My new eBook, The Prepper’s Guide to Food Storage will provide you with everything you need to create an affordable food storage plan, including what to buy and how to store it. Nothing scary and nothing overwhelming – you really can do this! Now available at Amazon. 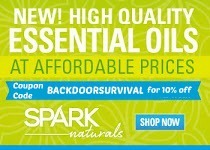 Spotlight: After a ton of research, I am now using essential oils from Spark Naturals for wellness purposes. There are a lot reasons one of which is there commitment to both quality and value. My recommendation is the Health and Wellness kit which includes all of my favorites or, if you are just getting started, the Essential 4 Pack which includes Lavender, Lemon, Melaleuca (Tea Tree) and Peppermint. Be sure to use the discount code “BACKDOORSURVIVAL” to receive a 10% discount. Survival Friday: How Safe Are Your Household Cleaners? I grew up and attended school in the Greater Seattle area. After spending many years as an executive in the software industry, I started a specialized accounting practice offering contract CFO work to emerging high tech and service industries. Awhile back I abandoned city life and moved to a serenely beautiful rural area on on San Juan Island in NW Washington State.These days I call Arizona home and am actively pursuing the purchase of a mountain retreat along the Mogollon Rim.As you may have noticed, I am a bit of a glamourista but hope you do not hold that against. me. My bug out bag includes makeup and other items to make me look and feel good if SHTF. Vegetable glycerin – who would have thought it. Thanks, Sharon, for the tip. Took your advice and ordered the glass droppers. All six broken on arrival from Amazon. Sent them back for refund. Well that is lousy. So many of my orders of small items (such as the droppers) arrive in huge boxes with a lot of air padding that I am surprised. On the other hand, Amazon has a great returns policy. How long will this scrub keep? Shanda – I am told that adding a small amount of Vitamin E to any homemade scrub or salve will act as a preservative and prevent them from becoming rancin. My jars are over six months old and still smell fresh. That said, as with all things related to oils and food storage, the cooler the temperature, the longer the shelf life. Help needed. Looking for an oil or salve that can take away the pain of Hand & Foot Neuropathy brought on by Type 2 Diabetes.